It was while staying at what is today the Europa and Regina that Claude Monet painted numerous scenes of Venice, including his famous San Giorgio Maggiore at Twilight and the Palazzo da Mula. Indeed, during the autumn of 1908, he and his wife Alice explored much of the city from their base at what was then called the Hotel Britannia. The hotel of today is actually the result of combining five separate buildings dating from the 18th and 19th centuries; each with a unique history. For example, one was formerly the location of the San Moise Theatre and where the very first opera by Rossini, La Cambiale di Matrimonio, was performed in November 1810. Rudyard Kipling is another esteemed former guest, staying in March of 1912. The core of the hotel is based around what was the Palazzo Tiepolo – this being converted into what was known as the Hotel Barbesi in 1868. 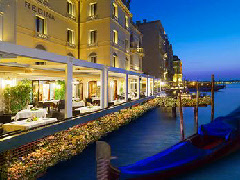 Today, however, the Westin Europa and Regina is one of the largest hotels in Venice featuring a total of 185 rooms. Five star rated, it offers some great views of the Grand Canal and is within easy reach of the city’s main sights and attractions either by gondola or on foot.